How Like An Angel by Margaret Millar, © 1962, Carroll & Graf 2000 mass market paperback, mystery – Joe Quinn, P.I. Private detective Joe Quinn gambles. That’s how he’s lost his job, car, clothes, and girlfriend; it’s why he’s hitchhiking from Reno to California, where he hopes to collect a small debt to see him through and get him back to Reno. He thinks his luck will change. Hitchhiking, he’s dropped off along a secondary highway short of his goal. Hungry, thirsty and tired, he takes the little used driveway to a religious cult commune called The Tower. He hopes the back-country compound can offer him food and water and a place to sleep until morning when he’ll try to find a ride into the coastal city that is his goal. There he meets Sister Blessing who, when she finds out Quinn is a private investigator, asks him to locate a man named Patrick O’Gorman. It proves to be no easy task: O’Gorman’s dead, apparently in an automobile accident several years before, having gone through a guard rail and into a flooding river. The body was never found, but was assumed to have washed down river and O’Gorman drowned. However, the more questions he asks, the less sure Quinn is that the death was as accidental as everyone insists. The story becomes more and more involved as Quinn continues to talk to people, many of whom don’t seem to want to discuss the accident. Each new conversation hints at something deeper, an angle not previously understood. But there are contradictions too. I kept guessing what happened, who did what to whom, how it was going to turn out, but every time I was wrong. When the last page was read, I was stunned, I’d been completely fooled. My wife read this soon after I did, and she enjoyed it too. She wasn’t as fooled as I, but still didn’t figure it out until the last 10-15 pages. Highly recommended. Rick, I am glad you shared this review. I want to read more books by Margaret Millar and it helps to have recommendations because they are so varied. This one sounds well worth seeking out. Good choice. I’ve only read a handful of Millars, but enjoyed them all. I’ve been reading the wonderful COLLECTED MILLAR series and enjoyed Margaret Millar’s work. 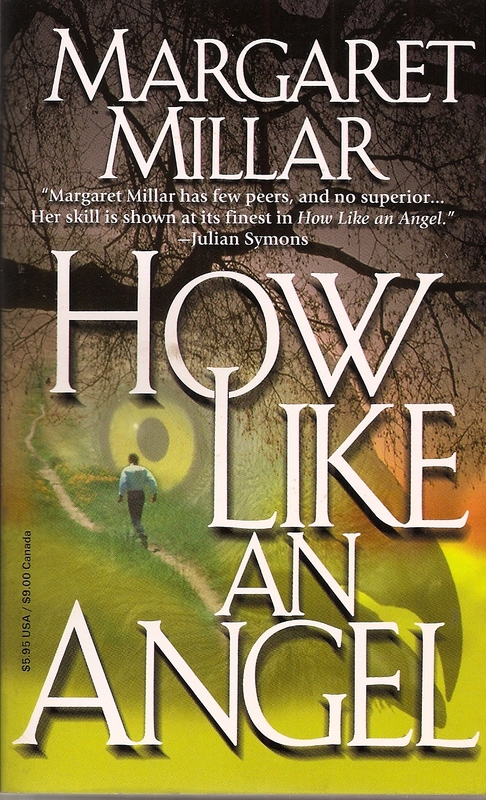 HOW LIKE AN ANGEL might be one of Millar’s best books. Richard, I still haven’t read Margaret Millar and this one seems like a good place to start, especially if she keeps the readers guessing till the end and prove them wrong. It is a good place to start. Go for it!